An introduction from L.A. State and County Arboretum, Agapanthus ‘Mood Indigo’ has deep violet colored tubular flowers. This Agapanthus will flower in mid to late summer on up to 3′ stalks. 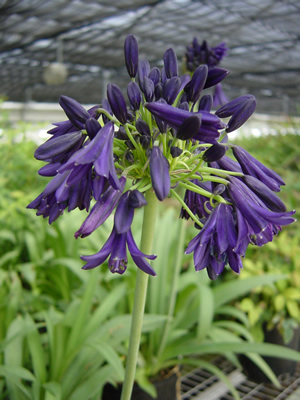 ‘Mood Indigo’ is a hybrid involving Agapanthus inapertus, so it also is winter deciduous. Like many of the Hostas this Agapanthus will come back stronger with more stalks after going dormant. ‘Mood Indigo’ is a slow divider and will reach 2-4′ tall with a 2-3′ spread at maturity.